For the first time in its history, The Coca-Cola Company (NYSE:KO) launched a lemon-flavored alcoholic drink in the southwestern island of Kyushu in Japan. The cola giant is betting on the Chuhai market, which are canned drinks made with shochu and carbonated water, traditionally flavored with lemon, though newer variants include lime, grapefruit, apple, orange, pineapple, and grape. Coca-Cola’s drink, called Lemon-Do, will be available with 3%, 5%, and 7% alcohol, placing itself in a highly competitive market comprised of giants such as Suntory, Kirin, and Asahi. Amid a declining overall alcohol market in Japan, Chuhai remains a bright spot given the fact that its inexpensive and ready-to-drink (RTD). RTD cocktails with alcohol levels of 9% or less are taxed at a lower rate in the country, making them more affordable. It has been claimed that the Chuhai market has even exceeded that of whiskey, growing by roughly 40% since 2011. 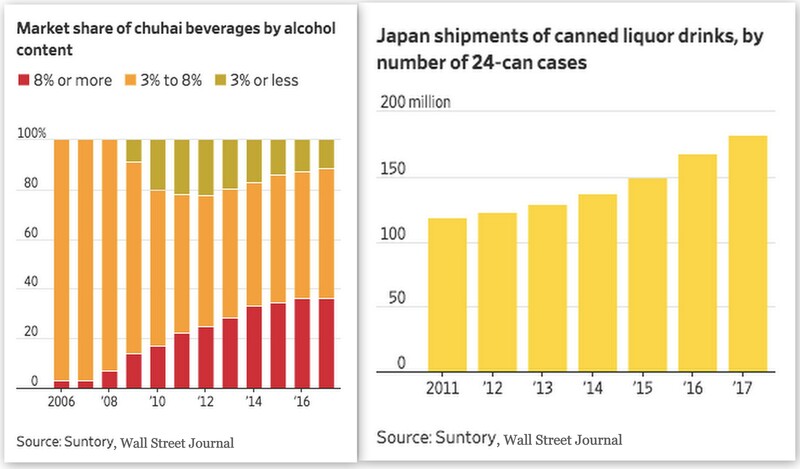 According to Suntory, the market for these drinks has nearly doubled to over 180 million cases from a decade ago, while the company’s own shipments have almost tripled in the same period. Coca-Cola’s foray into this market extends from its belief that Japan is a highly dynamic market, and always on the lookout for innovative products. The company launches an average of 100 new products every year in the country, particularly in the RTD tea and coffee market. While the company stated that it hasn’t ventured into the low-alcohol category before, it is willing to “explore opportunities” outside its core areas. Consequently, trying to capitalize on the fast-growing Chuhai market makes sense, and should benefit the company’s position in the country in the long run. Given the uniqueness of the Japanese culture and the fact that the Chuhai market is mostly limited just to Japan, the company does not intend to experiment with this strategy in the rest of the world. Although the cola giant has not given concrete plans for further expansion of the product in other parts of Japan, the product’s reception in Kyushu should play a big role in its decision.